Residents of Abule-Egba and environs who are still recovering from loses and destruction caused by the early morning pipeline inferno early Wednesday this week have pointed accusing fingers on what they described as an illicit romance between vandals kingpins and a sabotaging cartel within the Nigerian National Petroleum Corporation (NNPC). During a visit to the ruins by Business Hilights on Thursday, some of the residents who lost shops and goods said “vandals are not spirits to know when PMS will be running in the pipelines”. To them, “there are accomplices at NNPC who usually give the criminals exact time and the particular pipeline coming with the products”. The aggrieved residents recalled that it has become a yearly ritual for vandals to always have their ways especially during the eve of Yuletides within the axis. 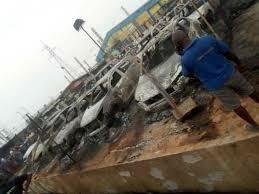 Few years ago, a similar inferno claimed scores of lives in Abule-Egba. Though no live was lost, it would be recalled that the General Manager Lagos State Emergency Management Agency (LASEMA) Mr. Adesina Tiamiyu disclosed that the fire outbreak occurred as a result of the activities of pipeline vandals. Tiamiyu said the fire, which resulted in the destruction of properties worth millions of naira started at about 2 a.m on Wednesday, December 19, 2018 destroyed numerous cars while the few people injured were immediately treated by the Lagos State Ambulance Service (LASAMBUS) and the Agency’s paramedics. He added that “the spillage from the bunkering activities came in contact with an ignitable source, the impact resulted in inferno as it ravaged several houses and cars. However, the prompt intervention by the Lagos Fire Service and LRU firemen curtailed the spread of the fire to adjoining buildings and Petrol Stations in the area”. The LASEMA Boss noted that investigation is still ongoing as to the cause and people involved in the incident, assuring Lagosians residing in the area that the situation in under control, stressing that people are free to go about with their normal business activities. He urged residents to ensure that any suspicious activities are reported through the emergency toll-free line 112/767 to avoid such unfortunate incident in future.